Rev. 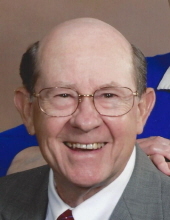 Larry Jackson, age 74, of Mayfield, KY passed away at 12:30 pm on Sunday, November 18, 2018 at his residence. Larry was born in Gates, TN on April 12, 1944 to the late Raymond and Velma Buckner Jackson. He graduated from Halls High School in 1962 before attending seminary at Mid Continent Bible College. For over 30 years he was the owner and operator of Professional Painting Services and was an active pastor for over 40 years. Larry's call to ministry had a large impact on this area. He first surrendered to preach in the early 1970's and was ordained at Macedonia Baptist Church. He began his ministry at Beulah Baptist Church then pastored at Enon Baptist Church, Millington Southern Baptist Church, Victory Baptist Church in Dyersburg, TN, Lovelaceville Baptist Church, Grand Rivers Baptist Church and Bible Baptist Church in Livingston County, and Blandville Baptist Church. Larry was the Associate Minister at Mt. Zion Baptist Church and served as Interim Pastor at Arlington First Baptist Church, Mississippi Baptist Church, Clinton First Baptist Church, and Pilot Oak Baptist Church. More recently, he was a member of Trace Creek Baptist Church and a member of the West Union Baptist Association. In the limited time away he had from painting and preaching, he enjoyed squirrel hunting and was a University of Tennessee Volunteers fan. He was a dedicated husband, father and grandfather who left a legacy of hard work and an example of always placing God first. He will be remembered by those he loved as someone who was very social, loved people and never met a stranger. A man who was an incredible encourager, could control any room he walked into, and was a great example of constantly being a soul winner for Christ. Larry is survived by his wife of 54 years, Magdalene Pilcher Jackson; his two daughters, Angela Williams and husband, Gary of Paducah and Sherry White and husband, Tim of Winchester, VA; his two sons, Joseph Jackson and wife, Leigh Ann of Calvert City and John Mark Jackson of Reidland; four sisters, Jennie Sue Young and husband, Sid of Nashville, TN, Joan Byars and husband, Jim of Greers Ferry, AR, Joyce Carpenter and husband, Dallas of Jackson, TN and Jeanette Kopp and husband, Mike of Clinton, MS; two brothers, Jerry Odell Jackson and wife, Nancy of Greers Ferry, AR and Edgar Jackson and wife, Kathy of Arlington, TN; eight grandchildren, Aaron Williams, Emily Smith (Madison), Zach White (Shelby), Janey Endres (Matt), Ally White, Peyton Jackson, Reece Jackson and Grayson Jackson; and two great-grandchildren, Blythe Endres and May Belle Endres. Funeral Services will be held at 11:00 am on Wednesday, November 21, 2018 at the Lone Oak Chapel of Milner & Orr Funeral Homes with Rev. Ronnie Stinson, Sr. and Rev. Ronnie Stinson, Jr. officiating. Burial will follow at Woodlawn Memorial Gardens. Visitation will be held from 3:00 pm until 7:00 pm on Tuesday, November 20, 2018 at the Lone Oak Chapel of Milner & Orr Funeral Homes. Expressions of sympathy may take the form of donations to: Trace Creek Baptist Church, 3577 KY-131, Mayfield, KY 42066 OR Gideon's International, P.O. Box 140800, Nashville, TN 37214-0800.